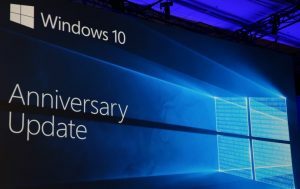 In August of 2016, Microsoft released a free update to Windows 10, named the Anniversary Update. This update makes several improvements to the original Windows 10 release. If you haven’t already applied this update to your Windows system, I recommend you install it. Click on the Start button in the bottom left corner. If you see your user account picture and name at the top left, Settings written out, and File Explorer written out as shown in the image below, then you have the original release of Windows 10. If you see your user account picture at the bottom of the menu (without your name), and the Settings icon at the bottom of the menu (without the text showing), then you have the Anniversary update of Windows 10. To download and install the most current version of Windows 10, click the Start button, then click Settings, then click Update and Security, and then click the big button to Check for Updates. For subscribers to the SOHO Tech security and monitoring subscription service, please contact me if you would like free assistance with this installation..